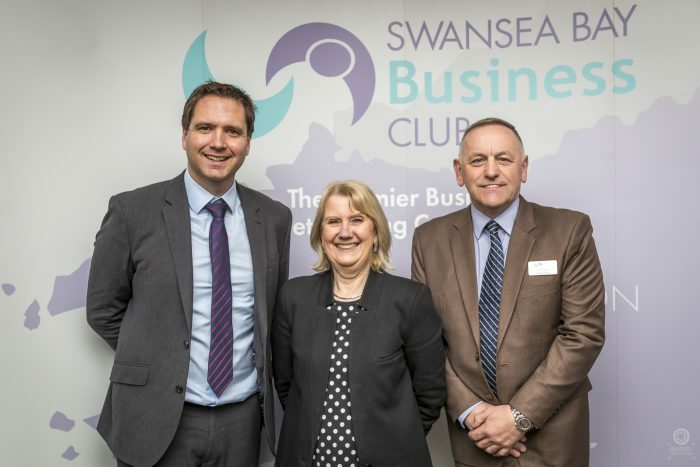 Swansea Bay Business Club continued their 2018 networking season of events with their re-scheduled St David’s Day lunch at the Parc-y-Scarlets in Llanelli on Thursday 18th October. The event, which was originally scheduled for March, had previously been cancelled due to the severe weather conditions and heavy snow, with the safety of guests in mind. 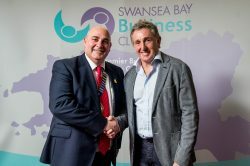 One of Wales’ favourite faces, Jonathan Davies OBE, joined members and their guests at Parc-y-Scarlets on Thursday and spoke at length about his career in Welsh rugby, his life after the game, both in the media and in business, and his commitments to charity. President of Swansea Bay Business Club, Paul Gardner, commented: “Of course we were all disappointed when we had to cancel this lunch back in March but we remained determined to hold the event and were delighted to see so many of those who booked with us earlier in the year finally get their chance to hear from a true Welsh legend. Continuing their tradition of offering added value to their members and guests, Swansea Bay Business Club is also set to host a free breakfast event in November for the Bank of England Agency for Wales’ November Inflation Report Briefing at the Village Hotel in Swansea. Delivering the briefing will be Deputy Agent at the Agency for Wales, Ian Derrick. Swansea Bay Business Club will also finish 2018 with two celebration events, a Beaujolais lunch on Thursday 18th November and a Christmas lunch on Friday 14th December. Comedian Tiff Stevenson and entertainer Stifyn Parri will be guest speakers at the respective events, ensuring the 2018 networking season draws to a close in style. Tickets to Swansea Bay Business Club’s Beaujolais and/or Christmas lunch at the Marriott Hotel in Swansea cost £40 for members and £45.50 for non-members. This will include a three-course lunch. The Beaujolais lunch will be held on Thursday 15th November and the Christmas lunch on Friday 14th December. Guests are asked to arrive from 12:15 for a 1pm lunch on both occasions. The Bank of England Ban Agency for Wales’ November Inflation Report Briefing will be held at the Village Hotel in Swansea on Friday 9th November at 7:45 am with the event finishing by 9:30am. The Business Club is always keen to welcome members and non-members to our events. Please browse upcoming events below and book your places for the 2018 season online now.